Happy Christmas week friends!! 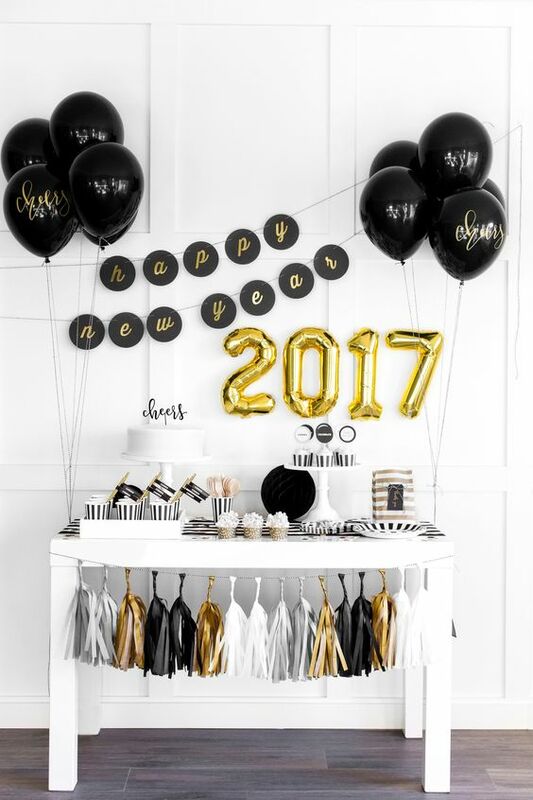 I wanted to change it up this week and instead of Weekending (the linkup is still live below), I thought I would share a little NYE inspiration since we'll be hosting for our friends this year! We have quite a few people coming so I've been pinning ideas of how to make our space work for the crowd! Let's start first with how I got the word out...the invites! Also, keep reading for a fun giveaway! Even though these are all our friends and we could have just as easily sent a Facebook invite or texted everyone - it's New Years Eve and I wanted to give it a little something extra! I went to Paperless Post to check out their selection of New Years Eve Invitations. After sifting through 182 options I narrowed it down to these four. With the party starting after dinner, we'll have a few light bites, some sweets & plenty to drink! For the apps I'm conscious of some of the food restrictions that my friends have - we have a few gluten allergies & some vegetarians. I'd like to have something for everyone! Bacon Wrapped Kielbasa You really can't have a NYE party with champagne & there will be plenty of bubbly at our house! via We have a full stocked bar cart that I fully intend on dressing up! We'll no doubt have a few different games to play throughout the night - our favorite is fibbage because there really isn't a limit to how many people can play & I just found this great printable game that the girls will probably love to play! To save on space we're going to have a separate table for the sweets & champagne set up for the countdown! This giveaway is a partnership with Nakturnal. Cheers, cheers and more cheers...you've got me hungry and excited to ring in 2017!!! Of course the BEST taste from the BEST party planner!!! Happy Monday angel!! So crazy that's it's Christmas week! I love all this NYE inspiration. The invites are so cute and I love the idea of the bite-sized appetizers. 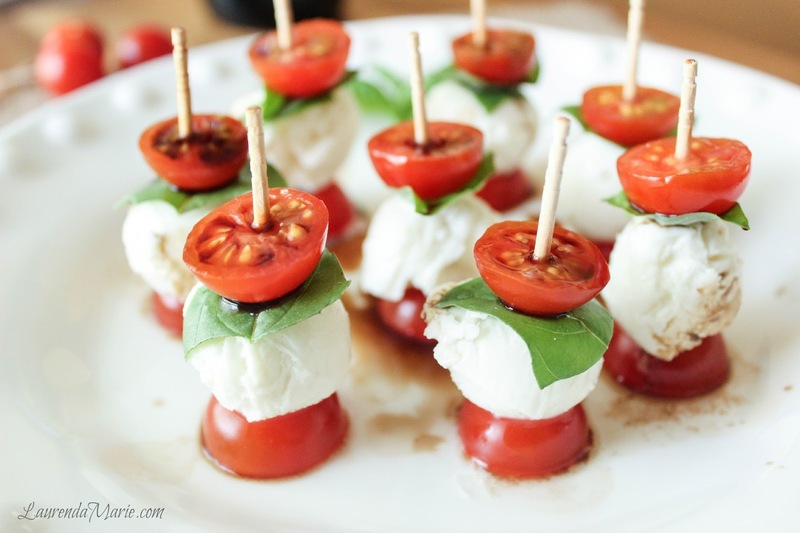 The caprese one looks delicious! And love the idea of the printable game. Sounds like your NYE party will be so fun! I'm sure that your party will be a total success. How cute are those props! 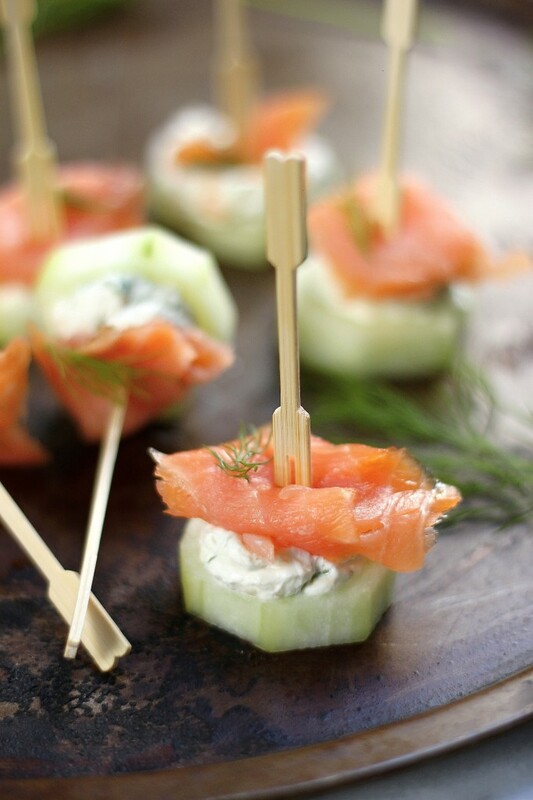 I've had the smoked salmon and cucumber bites before and it's a great choice to serve at your party along with all the yummy nibbles and bubbles! I love all the festive fun and decor for NYE! I'm sure your party is going to be a blast! Such delicious appies and that game looks wonderful!! So pretty! Love all these ideas! NYE is so fun and festive! These all make me so excited for NYE! I think the Pop the Cork invite is my favorite but they're all SO adorable! Hope you're having an awesome Monday!! That printable game looks so fun!! So many great ideas! I love all those apps, especially the bacon wrapped kielbasa. We are staying in this year and having some family over so I need to get some kid friendly games going, but also some stuff for the adults. I like those printables! ok such good inspiration in this post! i love the bar cart and all of those small bites - i'm a sucker for any app! the game idea - talking about all the best things - such a good idea! love it all! Those cards are all so cute! 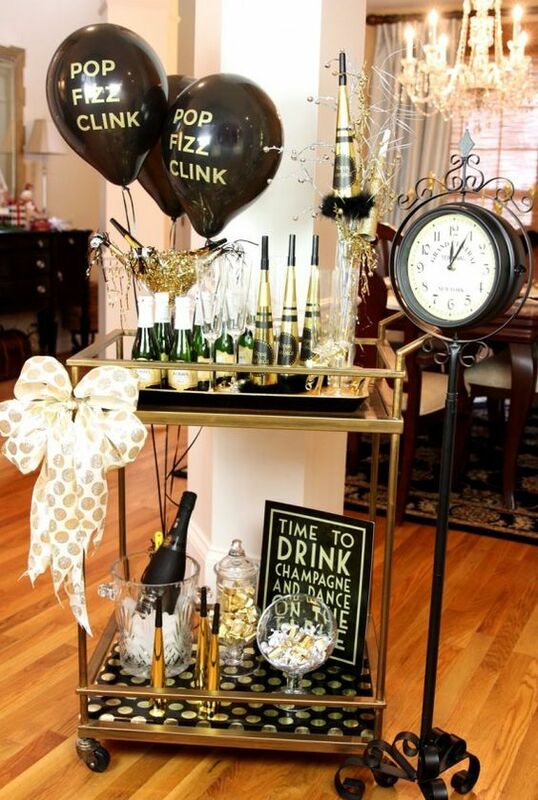 I love how that bar cart is decorated with the balloons- so fun! How fun!!! I love the 3rd invite - so cute. And all those apps look delicious! We had bacon wrapped dates stuffed with goat cheese and they were ridiculously good...and flew off the plate! Hope you have a great Monday! So cute! I love Paperless Post - can't wait to see what you do for the party! I haven't really been thinking about BYE but now I am! Of course anything gold and black makes me instantly happy so I love your inspiration photos! We've never actually hosted a big NYE party before, but I love all of the decor and food ideas that you have picked out! All of those Paperless Post Invites are also so cute, and a great alternative to just the normal Facebook invite. I hope that your Christmas week is off to a great start! We'll be in Austin TX, either partying at our Airbnb or going out to 6th street! I was checking the stuff out at the dollar spot yesterday - it was all super cute. I got a little HNY glitter crown. Love love love mini bites food. You make me want to throw my own NYE party now! We will be out of town but I may print that cute game to bring with us!! Such lovely invites! I hate going out for NYE but I'd be totally down for this party at home! So many good ideas. Your party is going to be amazing. You really know how to host an event! I love the invites that you narrowed it down to. The penguin one is my favorite mostly because I have a soft spot for penguins lol. For NYE I'm doing something I've never done before. Instead of going out or going to a party, I'm going to do a hike through a canyon at midnight & then hopefully be able to stay in the park to watch the sunrise from there. We always host a NYE party and use paperless post for our invites! I love your ideas about games for the night. I'm definitely going to use those printables! I love this post, girl, you have such amazing ideas; I know the party will be a hit! You have to let us know which invites you ended up going with. I especially love the first two, that second one is too cute! Also, thanks for hosting such a great giveaway, too! I hope you have the best week ahead, beauty! How fun that you're hosting an NYE party! 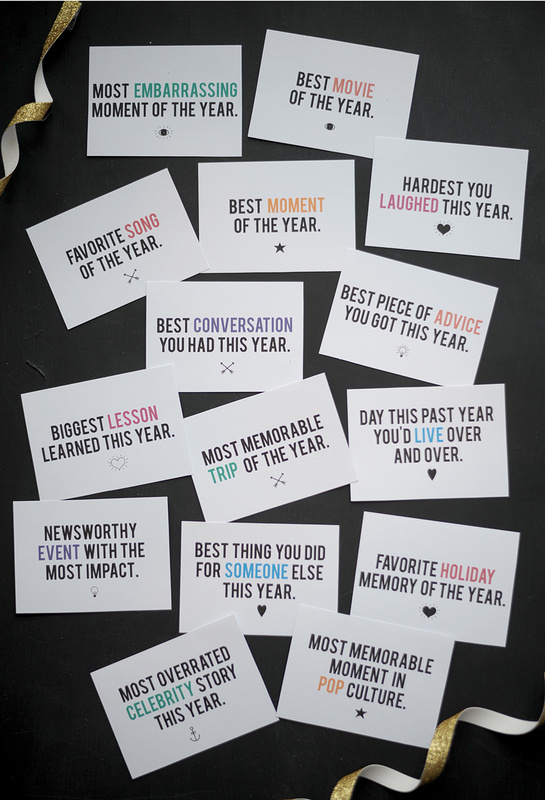 I love all your inspiration, especially that printable memory game. This is the first time in nearly 4 years that Ryan doesn't have to work the holiday, so we are excited to bring back our tradition of going to a movie and getting pizza and champagne for dinner. Games on NYE is a MUST!!! I love paperless invites! They are so great for casual get togethers. Sounds like you have everything covered and your menu sounds SO good! Sounds like you have everything pretty planned out...and I can't wait to see how it all turns out, because I know it will be fabulous! Love the invites...especially the penguin, so cute! oh wow these are great.. love the invite with the penguin. so cute! I can only imagine your NYE party! You have such great style so I know it'll be amazing! I love that first Paperless post invitation :) It's my favorite! Honestly, we don't know what we're doing yet...haha. Christmas has taken up so much of our brain space! We'll probably just do something at the house with the kids. This is one of my favorite posts of yours all year!! 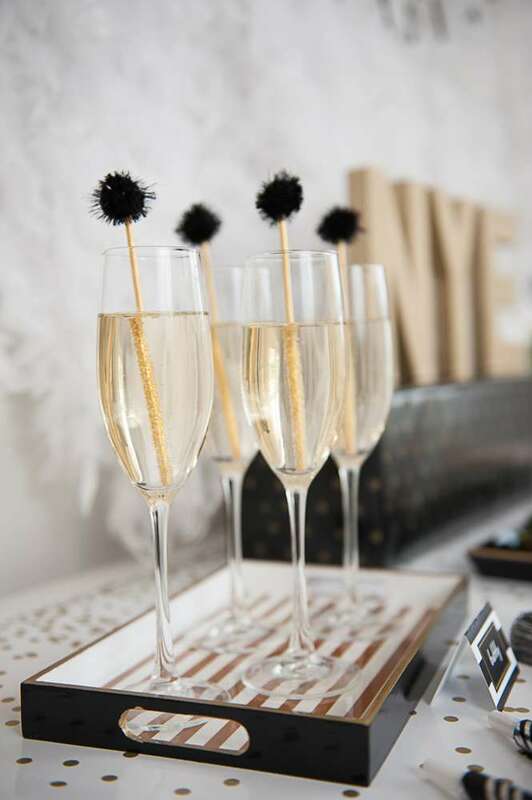 I'm obsessed with all those ideas for your bar cart and those apps look amazing!! I still have no real plans for NYE but this is inspiring me to want to throw a party! Amazing round up! Merry Christmas week, lady!! The food, the champagne and the party decorations. It gets me excited for New Year's Eve even though we rarely go out anymore!!! How exciting that you guys get to host! You are going to have so much fun! We have never hosted anything for NYE before, but I would love to do it in the future. Those champagne flutes are just so pretty! I love graphic design and those invitations are seriously cool. So much great NYE inspiration in this post. Those invites are so fun!!! I just pinned a bacon wrapped cocktail sausage recipe like an hour ago, that is too funny! I think I am going to make them and my bourbon maple kielbasa recipe on Friday for a Christmas dinner I am hosting at my house with my sister and dad. Hope you have a great weekend!!! I love the Let's Get Fizzy one! So cute! Your party looks like it will be so fun! Don't you love the metallics that are associated with a New Years party?! I love your food options and that you'll have games! those invites are so cute! darling post! Girlfriend- you are on it! Love all of it you picked out...every single thing. The games sound fun and I need to play Fibbage because your snaps always look so fun! Omg your party is going to be a blast! Love all the cute invites and all your fun ideas! 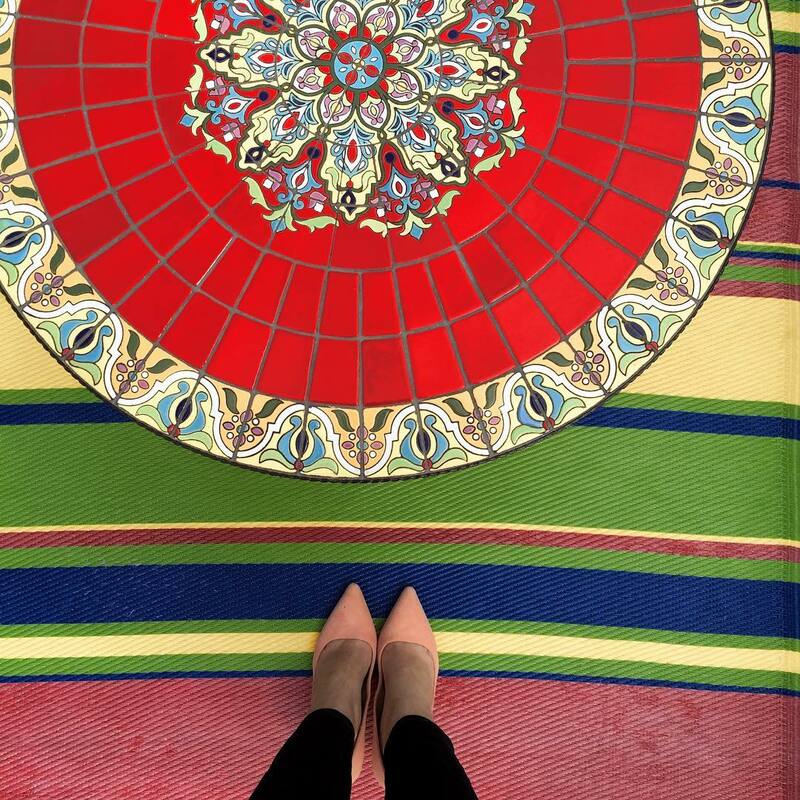 These are great photos, nice post! Looks great! We are headed to a family friendly party, but I love getting dressed up. Good luck with the party! I saw those salmon bites on Pinterest last week and they are at the top of my appetizer list to use for this holiday season! That printable game looks like so much fun! Sounds like it will be a fab evening! I'm still not sure of my plans. I usually hostbut think I'll sit out the hosting duties this year. Hopefully somewhere fancy! I love all of these ideas- so classic!! We normally host a NYE party but might mix it up this year! 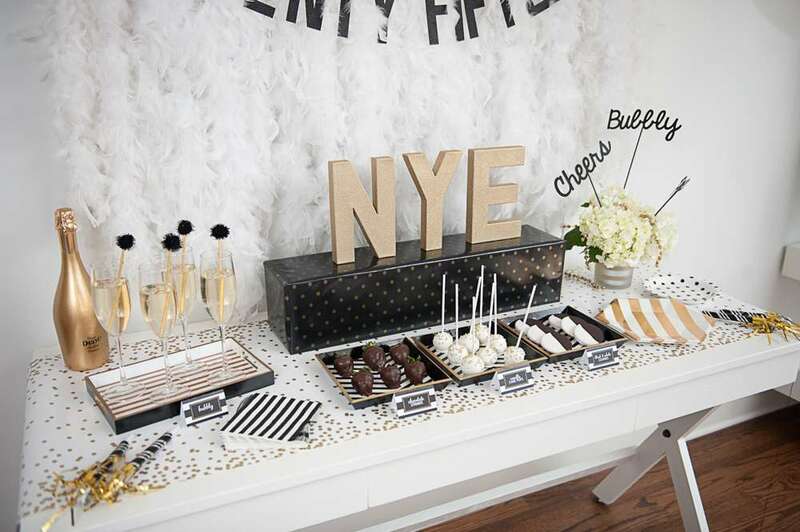 This is the best NYE party inspiration! Love all of these ideas! That printable game looks like fun! 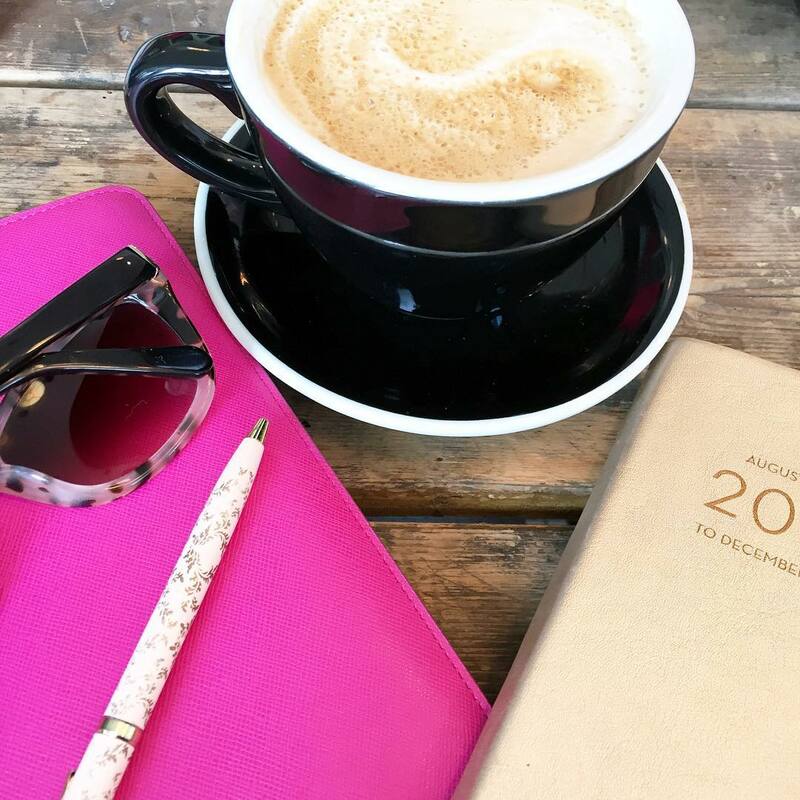 You are going to have a busy week getting ready but looks like you've got it all covered! 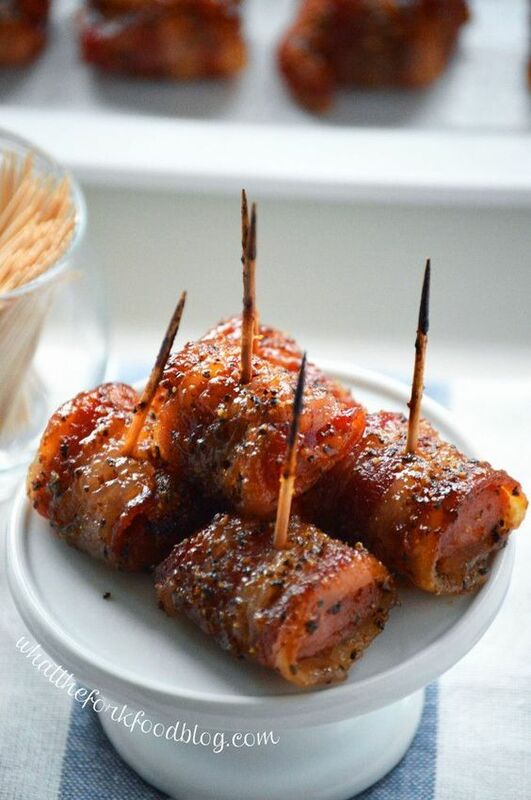 Those bacon wrapped kielbasa look scrumptious. We will be staying in. I'm all about pajamas, root beer and rolos - that's our tradition! Have a great week! This is such amazing inspiration! Makes me excited for the impending holidays! Super cute invitations too. NYE is always such a favorite...no more stress form the holidays and only a fresh new year to look ahead to! Fun post. My husband works in the hotel industry so he will most likely be working on NYE, but I love to plan a party with my kids! We toast with cookies and milk, play games, and watch the ball drop together! You have alot of great ideas here! I'm sure you will all have a great time at your NYE party. I honestly don't even know what I'm doing as of right now. Plans are still up in the air.